KAVITA CHHIBBER reviews the new book by Dr Jag Sheth & Raj Sisodia. Let me say at the onset, that Dr Jag Sheth is one of my favorite people. I only wish I had studied under him, because he is always so animated, consistently brilliant and constantly thinks outside of the box. His new book 'Tectonic Shift', which he co-authored with Raj Sisodia, was published last month and is already the number 1 bestseller in India. Perhaps what makes all his books so interesting are the projections that he makes. Very often he manages to give a new twist to an old theory and that again makes his work and speeches so refreshing. 'Tectonic Shift' epitomizes both those points. The authors show examples where governments that were not delivering economic growth, found themselves being shown the door. “ Clearly when voters in western democracies go to the polls, they are influenced not so much by ideology as by their stomachs and their wallets..” so clearly ideological considerations have been replaced by economic pragmatism. One key issue for advanced countries will be to battle the effects of an aging population and the fact that they have similar strengths and weaknesses. The solution to find a balance would be by joining hands with young developing nations with many untapped resources, and this according to the authors is what will drive the realignment of nations as the world goes global. The developing countries will have to overcome their suspicion of developed countries and once that is achieved, it can be a win-win situation for every one. GDP has given way to PPP(Purchasing power parity) and as a result of this new way of measuring the new world economic order countries like China, Mexico, Indonesia and Brazil have come to the forefront as nations to watch. New powers in the making, strange economic alliances would be the mantra for the 21st century realignment of nations. 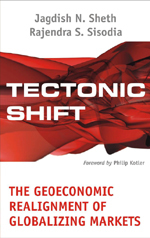 The key focus of the book is, indeed on the geoeconomic realignment of nations. It shows how three major groups are emerging and they will benefit from focusing on trade partnerships and facilitating economic growth within the region. The authors say that America and Germany will lead their coalitions and China will align with Japan and South Korea. According to the authors, India will become one of USA’s strategic partners and replace China, Russia will align with Europe and China will form the third block aligning itself with Japan and South Korea. An intriguing projection is their prediction that Israel will distance itself from the United States and will align itself with Russia, and between 5 and ten years Britain too will move away from the USA and become a strong player within the European union. The authors strongly believe that the world will be more peaceful and prosperous as a result of being tripolar. “In a tripolar world… a high degree of stability is built in. If any of the three powers becomes overly belligerent, it will likely be countered by a united front of the other two. A tripolar world thus offers an inherent deterrence against military or economic adventurism.” This will also lead to resources being diverted towards economic development instead of defense. The book then goes through the evolution and growth of the three trade blocs, the countries that are still not a part of the tripolar scenario and the efforts required not just to make these three blocs globally competitive, but also studies the ways to create a strong bloc integration and how obstacles to this realignment in the making can be overcome to benefit everyone. Exciting and thought provoking, this book is a MUST read for all. Tell us what you think of this feature. Email us at contact@nripulse.com.